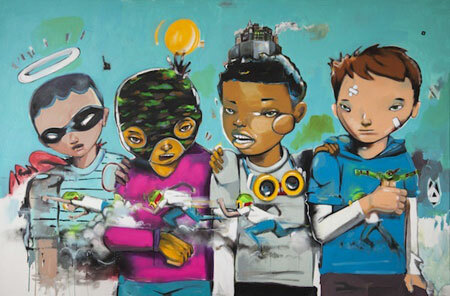 33 years old and 6’8″ tall, Hebru Brantley is Chicago’s fastest-rising visual artist. A street painter turned fine artist making comic-book style pop-art paintings, his figures reflect his growing up on the south side of Chicago. Brantley’s works can command upward of $100,000. Scottish artist Andy Goldsworthy’s latest work is all about the elements of nature. He explores and seeks intimacy with nature by using leaves, stones, snow, ice, and wind…yes, wind. Goldsworthy makes his art, it stays for a while, and then it is gone. The art may disappear but Goldsworthy photographs each piece, the process, and the moments of peak and decay. We may no longer have the art, but we have the memory. Irish painter, Genieve Figgis, produces paintings rich in color, texture, humor and the macabre. Her canvases draw upon art history, featuring sumptuous domestic interiors and stately country homes. The protagonists are dressed in finery and are innocently feasting, horseback riding and entertaining in their grand salons. But all is not well. Behind the most mundane facades, Figgis’ figures appear as either faceless or foolishly grinning, ghoul-like creatures. The viewer is shocked, bewildered and intrigued at the turn of events and stops dead in his tracks. Of your 3 featured artists, Andy Goldworthy’s Ephemeral Art is the most appealing to me. In point of fact, all art (life itself!) is ephemeral. Optimists and believers/artists-who-are- optimistic give us something to hope for, even if it’s only “blowin’ in the wind”. Kirby, I looked up Andy Goldsworthy on Google Images. Oh my goodness! He makes me at a loss for words. Some of the pieces are so huge that I wonder if he does it all by himself and/or if some of them take a very long time. I will find out more. Thanks. Intriguing as ALWAYS. Love reading your blog. Feel like I learn something very sophisticated! Makes me feel worldly and not Hill Country! Wonderful post, Kirby – I like the way you feature a range of artists and ideas. Andy Goldsworthy has been one of my all time favorites for years – I have several of his books. There is something about his work that’s incredibly universal – that deep connection with nature. And yet the painters you feature are both fascinating — commenting on modern society in a new way while using paint and canvas – an old medium. Wonderful! What I love about all of your blog posts are that they are so thought provoking. It is doubtful that I would have run across these three artists on my own. Thank you for expanding my world. One of the most engaging exhibits at La Museum of Art was ANDY GOLDSWORTHY, His work takes on a magical element surpassing the norms we are used to. 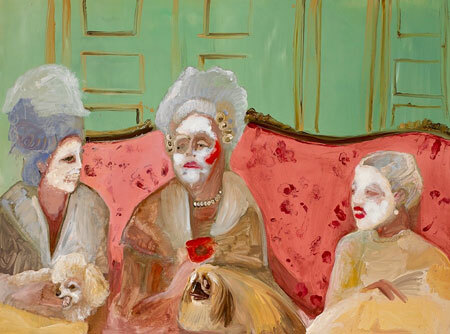 Geniveve Figgis is an extraordinary artist I have followed for some time. AS you stated so well, She is original. The first artist, I am not so impressed with the ‘street art’ Comic style that leaves me bored. Richard. Thanks for your insightful & forthright comment Figgis’ macabre faces on her figures remind me of the angst the faces of the figures in your work sometimes show. I am interested in the transition from street artist to fine artist. It makes me think about former gangsters that become rap artists. How long does the glow last after the rebel days I wonder.